As far as temper tantrums go, this is as shocking as they come. 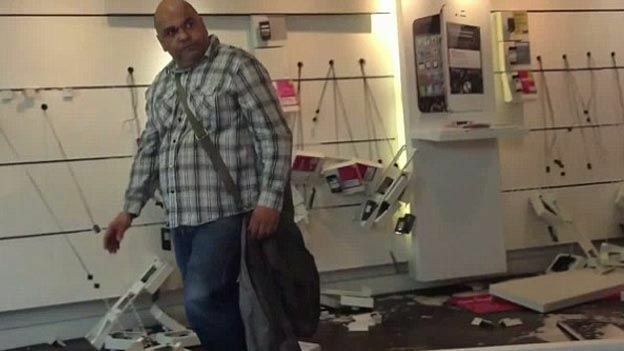 An irate customer trashed a T-Mobile store in Manchester city centre on Saturday after apparently being refused a refund for a mobile phone contract. Staff stood back in disbelief as 42-year-old Jason Codner began to systematically rip phone displays off walls and overturn furniture. The middle-aged man, from Salford, also set off a fire extinguisher, while passers-by began filming his angry episode on their mobile phones. Codner's shocking display was later posted on YouTube where it has already received nearly half a million hits! He was later led away by five police officers and charged with criminal damage and public order offences. According to a statement released by the Met, Codner is due to appear in court on July 30. A T-Mobile spokesman said: “The customer's dispute was in relation to a refund that we were not able to give - as it was clearly outside of the stated terms and conditions. “We are currently assessing the damage, and will be re-opening the store as soon as possible”.